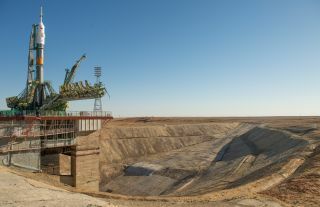 The Soyuz rocket is seen on its launch pad shortly after being lifted into its upright position on Monday, Sept. 23, 2013, at the Baikonur Cosmodrome in Kazakhstan. Launch of the Soyuz rocket is scheduled for Sept. 25 EDT (Sept. 26 local time) and will send Expedition 37 Soyuz Commander Oleg Kotov, NASA Flight Engineer Michael Hopkins and Russian Flight Engineer Sergei Ryazansky on a five and a half-month mission aboard the International Space Station. Three astronauts are set to blast off toward the International Space Station this afternoon (Sept. 25), and you can watch their out-of-this world journey live. Two Russian cosmonauts and a NASA astronaut are slated to launch aboard a Russian Soyuz spacecraft from Baikonur Cosmodrome in the Central Asian nation of Kazakhstan at 4:58 p.m. EDT today (2058 GMT; 2:58 a.m. Thursday in Kazakhstan). You can watch the launch and docking live on SPACE.com here beginning at 4 p.m. EDT, courtesy of NASA TV. Expedition 37 NASA Flight Engineer Michael Hopkins, far left, Soyuz Commander Oleg Kotov and Russian Flight Engineer Sergey Ryazanskiy, far right, wave and give the thumbs up following a press conference held at the Cosmonaut Hotel, on Tuesday, Sept. 24, 2013, in Baikonur, Kazakhstan. Kotov is a spaceflight veteran with two six-month stays aboard the space station under his belt already, including a stint as commander of Expedition 23 in 2010. But this will be the first trip to orbit for Ryazanskiy and Hopkins, who was chosen as a NASA astronaut in 2009. The three newcomers will stay aboard the International Space Station for nearly six months, eventually departing in mid-March. The station's current occupants — cosmonaut and Expedition 37 commander Fyodor Yurchikhin, NASA astronaut Karen Nyberg and Italian spaceflyer Luca Parmitano — are coming back to Earth on Nov. 11. When they leave, Kotov will become commander of the new Expedition 38. Today's blastoff complicates things a bit for a private cargo vessel that launched toward the station on a demonstration mission on Sept. 18. The unmanned Cygnus spacecraft, built by Virginia-based aerospace firm Orbital Sciences, was supposed to dock with the $100 billion orbiting lab on Sunday (Sept. 22). A software glitch scuttled that plan, however, and Cygnus is now slated to arrive at the station no earlier than Saturday (Sept. 28). Orbital Sciences holds a $1.9 billion deal with NASA to make eight unmanned supply runs to the space station using Cygnus and the firm's Antares rocket. The current mission is a critical test flight, designed to show that the company is ready to start making its contracted cargo runs. NASA also inked a $1.6 billion cargo deal with California-based SpaceX, which has already completed two of its planned 12 supply missions to the orbiting lab using its Dragon capsule and Falcon 9 rocket.